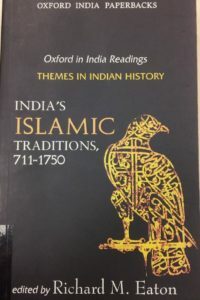 This is a volume in the Oxford Series, Themes in Indian History. It contains contributions from scholars from around the world. Featuring the precolonial period of Indian history, this book brings to light the rich world of Islam as it was vibrantly practised at the time in the subcontinent. India’s Medieval Muslims included people of various geographical origins, sects, classes, professions and languages. The introductory essay looks at the state of the scholarship respecting Islamic traditions during this period. Also discussed are some vital questions such as whether Islam ought to be considered a foreign intrusion into India, how Muslims in authority treated non-Muslims, and how India became home to more Muslims than are found in the Middle East itself. Part One of the volume features how Muslims represented themselves in a context where they were the minority among non-Muslims, and also how non-Muslims represented them. Interestingly, there was not just one way in which Muslims viewed non-Muslims but rather a broad spectrum in the level of acceptance observed in different people and in different contexts. Part Two talks about state power when it was in the hands of Muslims. It discusses individuals like Akbar and Aurangzeb and touches on such issues as the jizya tax and the attitude of Sufi Shaykhs toward the state. The third part of the volume looks at textual material in the areas of Muslim history, Sufi romance literature and law. The fourth part is dedicated especially to the Sufi and Shi’i traditions of Medieval India. Discussed in this part are the careers of the Sufi shaikhs, the traditions that have emerged around Sufi shrines, the literature of the Ismaili Muslim communities and the Muharram rituals of the Twelver Shias. In the final part of the volume, we find a consideration of the Islamic traditions that evolved in the outlying regions from Kashmir, to eastern Bengal, to the Tamilnadu. This volume has something to offer students and scholars with a wide variety of particular interests is respect to Islam and Indian history. The book is part of the MARC library collection.